Combustion (or burning) is a fast self-sustaining chemical reaction that releases a large amount of heat. Burning candles, forest fires, log fires, the natural gas burning in home furnaces, and the burning of gasoline in internal combustion engines are all examples of common combustion processes. Many of critical technologies today employ combustion as the key element of their operation. The objective is to convert the stored chemical energy of the "fuels" into thermal energy. To achieve this, three things must normally be present: a fuel, an oxidizer, and an ignition source. Today, nearly 85% of the world's energy is produced through combustion and hence is vital to our way of life. Therefore, it poses great challenge to maintaining a healthy environment. Improved understanding and control of ignition and thereby combustion will assist us in dealing with the problems of pollutants formation, performance, and fuel economy. To this end, it is crucial for engine design engineers to be aware of basic knowledge and recent advances in combustion-initiation (ignition) issues to more intelligently evaluate and harness their potentials. The thermodynamic and fluid mechanical states of the unburned charge near and at the time of the spark strongly affect the quality of the combustion and therefore the emission of the pollutants from the engine. The engine performance and drivability are also strongly affected by a weak ignition. The so-called cyclic variability, which affects and bounds the lean and knock limits of an engine design is to a great degree influenced by the ignition system. Equally important, the ignition system can and is being used to provide local in-cylinder information on air-fuel ratio, misfire, knock, and mass fraction burned in each individual cylinder. Hence, great potential exists for applications of this information to attain a more fuel efficient and environmentally compatible engine. This seminar starts with a concise yet effective review of the combustion issues and terminology in engine to establish a uniform knowledge base. Then the focus is turned on the fundamental knowledge on charge ignition. Commonly-used ignition systems are described next followed by the explanation of four phases of the spark ignition. 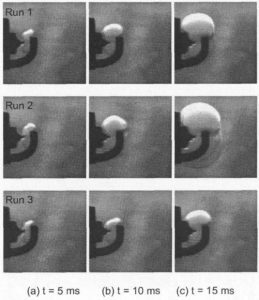 Effects of key ignition variables on performance and emission of pollutants are described in details. 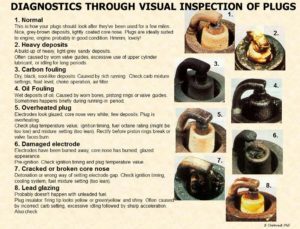 After the introduction of some alternative ignition methods, a comprehensive presentation on engine diagnostic and control opportunities through use of ignition system is given. The ignition of ultra lean mixtures is fully covered next. Throughout the seminar emphasis is put on effects of ignition system on engine performance, efficiency and emission of harmful pollutants. 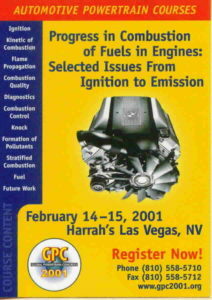 Engineers in other areas than automotive will find this seminar very informative and useful for their ignition problems. Identify key design components of an ignition system for optimum combustion chamber design and low engine emission of pollutants. This seminar will be especially valuable for engineers, technical and project managers, researchers, and academicians involved in ignition and combustion/emission aspects of the combustion engines. Currently, the design of many components in these engines are affected by combustion and emission control measures to meet customer’s, federal and local government’s demands and regulations. Therefore, engineers working on the design of components for high efficiency and performance of combustion engines as well as those directly and indirectly involved in ignition and emission reduction strategies will highly benefit from this seminar. Additionally, this seminar provides adequate background for engineers and managers in contact with those directly involved in ignition, combustion, and emission issues and will prepare them for a more efficient and intelligent communication style in an interdisciplinary environment. 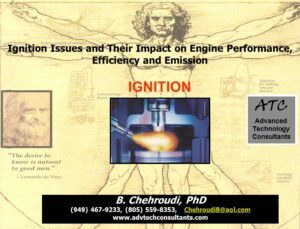 Engineers desiring to expand their understanding of ignition and its impact on combustion and emissions from engines will highly benefit by attending this seminar. Due to ATC's low overhead, direct-contact clients are offered a competitive and cost-effective package. Individuals interested in these seminars should contact Advanced Technology Consultants (ATC) directly. Alternatively, this seminar (prepared by the ATC and delivered by a award-winning ATC consultant) are also sponsored by the Society of Automotive Engineers (www.SAE.org). Click here on IGNITION to see the SAE page for this seminar. NOTE: Professionally-prepared "audio-video Powerpoint-type presentations" of these seminars are available for purchase by companies. Each slide is presented with a clear audio by the consultant, describing the subject, while a digital pointer guides the audience to where the attention is to be focused. Companies can put such audio-video presentations on their intranet to be used by their employees. It is a cost effective way of approaching professional training, which also contributes towards R&D, design, and intelligent new product development efforts. Presentations are updated every year at a fraction of the original cost. For a sample presentation click on the word "IGNITION" in the picture to get a feel of how information is transferred (High-speed internet access is recommended. Otherwise, download may take a few more minutes). The actual copy sold is of high resolution with high quality sound. For more details and pricing please contact ATC. 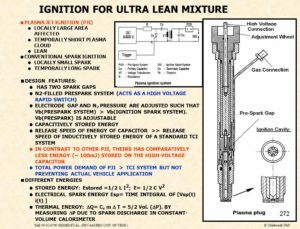 What determines the amount of ignition energy?